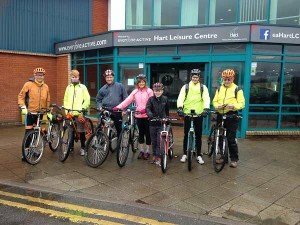 A cold rainy Saturday afternoon in February but seven brave souls turned up at Hart Leisure Centre for the first pedal2gether off-road ride. Bob McLeod wrote on Facebook, "Had a great time on Colin's ride this afternoon. Those youngsters will soon be needing longer rides and probably younger leaders. Their bike skills were excellent. Hope we can keep their interest." Excellent afternoon and thanks guys for coming on the ride.